This was the parish church of St Iberius' parish. 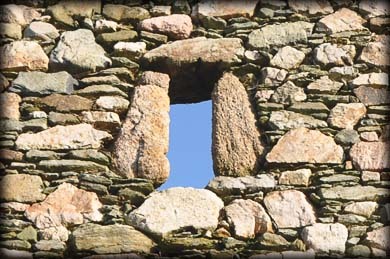 The west gable, pictured above, and parts of the north and south walls survive. It was originally a nave and chancel church with a round chancel arch. The remains of a round headed doorway in the south wall is still present. St Ibar or Iberius was a 5th century Irish missionary who founded the monastery on Beggerin Island County Wexford. The island is now part of the Wexford North Slob. 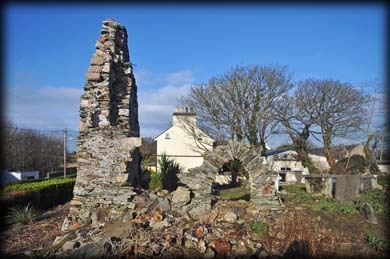 The remains of an early church still survives on the slob. A number of other churches in Wexford are dedicated to him as well as this church here in St Iberius Townland. He is believed to have died c.504-510AD. Situated: Head south from Wexford Town on the N11. After Tagoat take a right turn for Carne Beach. The church is on your left about 1 kilometre before Lady's Island. Discovery Map 77: T 1055 0847. Last visit Jan 2015.